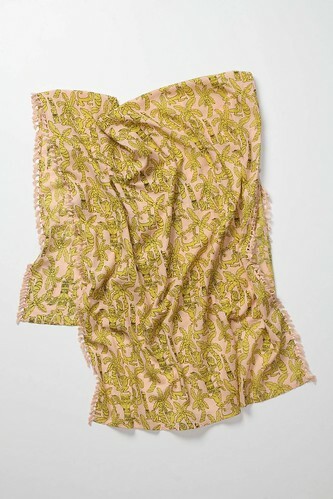 Anthropologie, the store I adore but can’t really afford (aside from the sale section), has brought in some tropical inspirations for their spring/summer collection. The theme is Sun & Sand, but this is not your typical aloha wear. 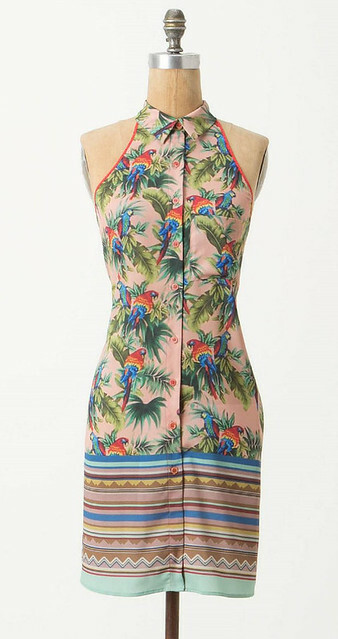 While I still adore the Polynesia Greetings dress I got a few years ago, I’m not so thrilled with these two frocks. The bird of paradise Aija Maxi Dress ($158) and parrot printed Henga Shirtdress ($168) from Dream Daily by Rozae Nichols seem like they’d be less than flattering on anyone but a model, and the Southwestern style stripes at the bottom are an odd juxtaposition. 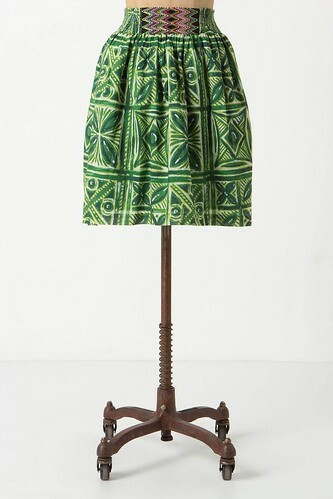 The Fresh Cut Skirt ($68) features a neat tapa print, though they don’t call it that by name. The poetic copywriting describes it in terms of a grassy lawn: Just-mowed clippings cover Vanessa Virginia’s easy cotton A-line. I like the looks of this, but again I’m kind of boggled by the beaded waistband. 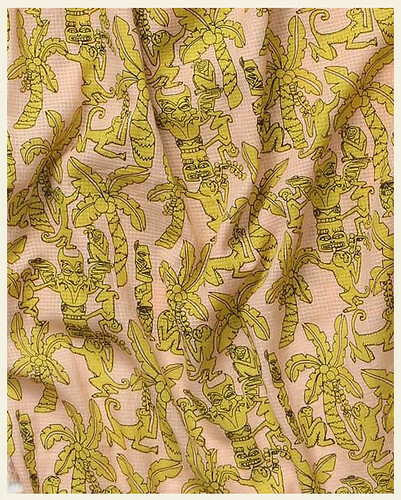 There’s even a Tiki Scarf ($68) with coconut trees, monkeys and tiki carvings. Here’s a close-up so you can see the somewhat questionable pattern. The thin tikis in side profile aren’t bad, but I’m not a fan of the other hawk-like totems. 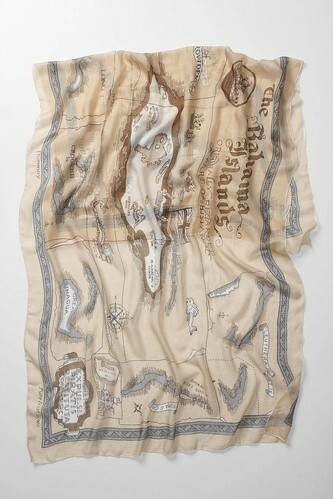 Although it’s Caribbean and not Polynesian, I preferred the Bahamian Scarf ($98) with its antique-style map with landmarks like Mermaid’s Pool and Blackbeard’s Tower. 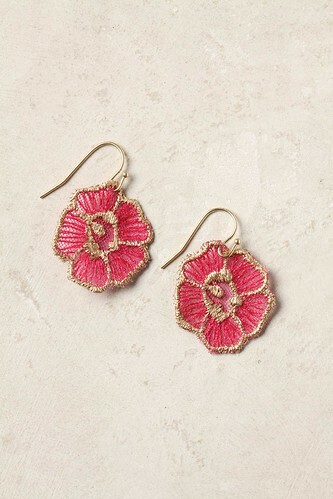 The most surprising discovery was that Anthropologie even has some rattan furniture on their site. 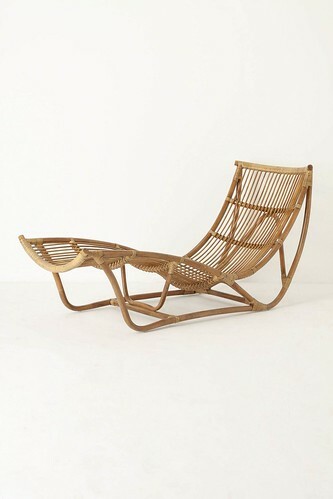 There was the handwoven Banda Chaise ($398) along with a couple of pendant lamps with rattan shades. 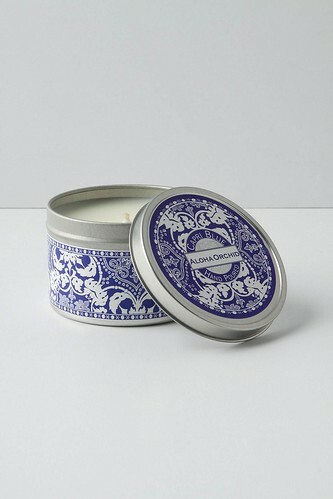 Capri Blue candles by Aspen Bay bring the scent of a sweet South Pacific breeze to my tiki room at home. My favorite is the Volcano fragrance, but don’t expect the smell of sulfur and ash, it’s “tropical fruits, sugared oranges, lemons, and limes, redolent with lightly exotic mountain greens.” If you prefer something more floral, try its counterpart Aloha Orchid.